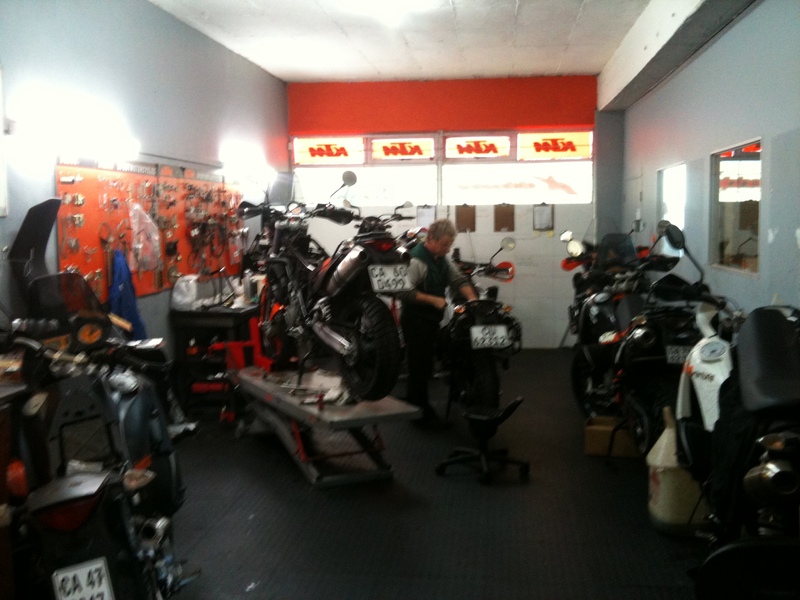 Up bright and early in my overalls for a day in the workshop at KTM Cape Town. I rode in on my brand new “R” … at under 4,000RPM as its being run in for 1st 1,000Kms which is a bit dull when you have a new bike.. but an investment in the quality of the engine going forward. Louis and Kevin were extremely hospitable and patient answering my many questions such as ..”and what does that do?” with repies like ” that’s a spark plug, Sir” ..” your new Adventure has a twin spark”….” if you had a BMW you would know what one looks like… !! !.” Well Quite. 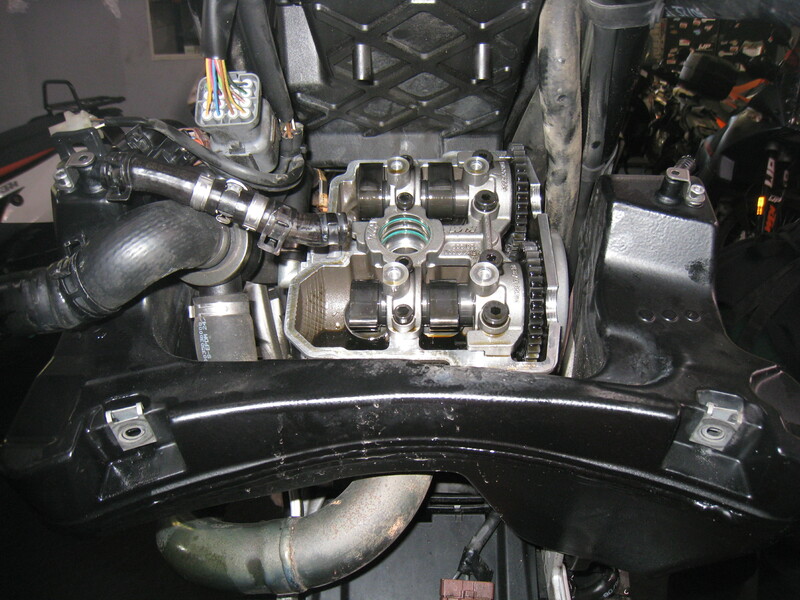 I was Louis’ apprentice for the day and he expertly showed me how to perform the full 15,000km service which was being done on Fanny’s orange 990.. including how to change the chain and sprockets, change the shims, drain and change oil, clutch and brake fluids without leaving airpockets in the system and clutch fluid over my head, change oil and air filters, change brake shoes, adjust spokes, correct torque settings on all bolts etc etc.. and most importantly put it all back together without bits left over. I learned the importance of correct sequences of dismantling and assembly, keeping out sand and dust, and which tools to use… both those that are in a workshop like at KTM and those that I can be expected to carry on our expedition and have to use in the field. 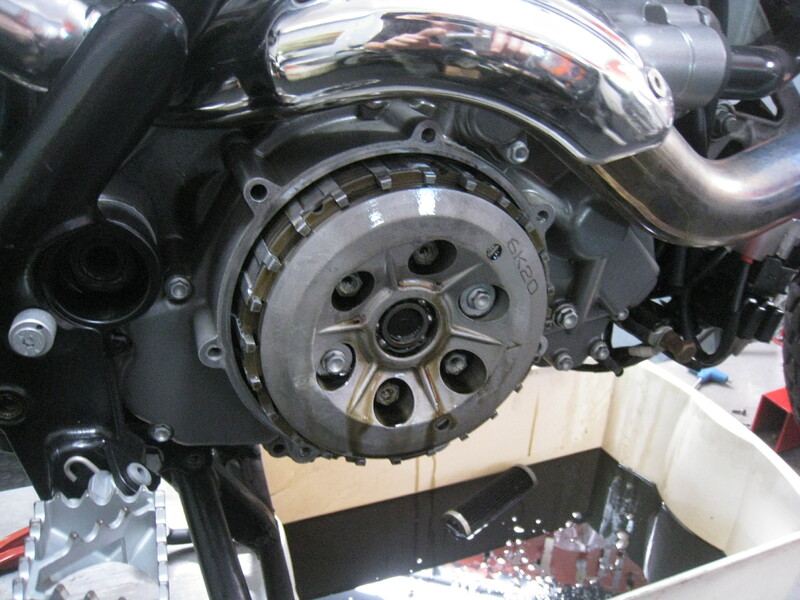 The LC8 is quite a complicated bike, but you can see the build quality and engineering excellence and this experience has reinforced our decision to go KTM… because Fanny and I don’t have fixers and land cruisers to carry spare rear shocks and suspension mountings. 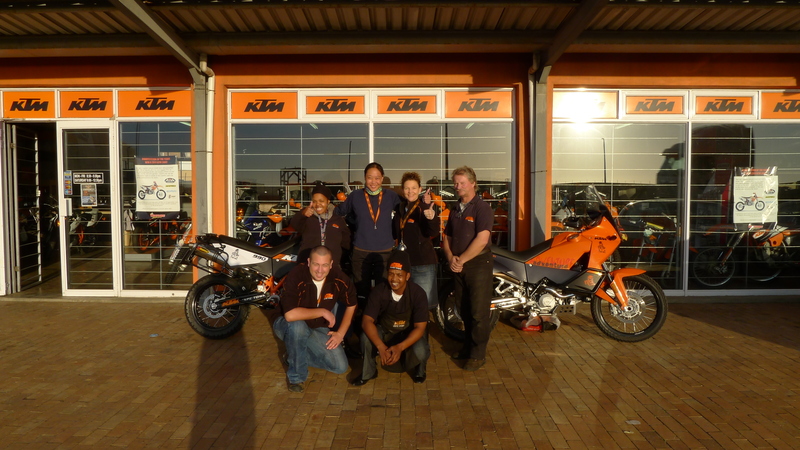 Many thanks to Louis and Kevin of KTM Cape Town for putting up with me in their workshop all day. Also thanks to Siddique, Amanda and Donovan and team.